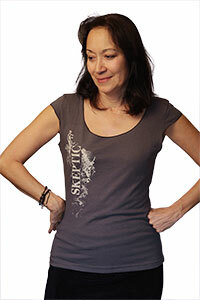 Shop Skeptic: Show Your Skeptical Colors! 1 for $4 or BUY 2 GET 1 FREE! In this week’s Skepticblog, Michael Shermer discusses Steve Job’s “Reality Distortion Field,” reminding us that Jobs’ modus operandi of ignoring reality is a double-edge sword, and that reality must take precedence over willful optimism. 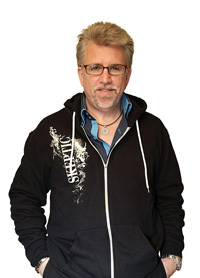 In this episode of Skepticality, Derek sits down with Mike McRae, a science writer and touring science communicator for Questacon: Australia’s National Science and Technology Center. 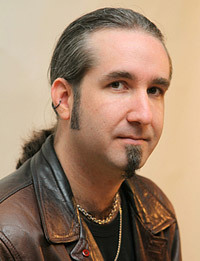 Mike has recently released his latest book, Tribal Science. Derek and Mike discuss how the book came about and how our current culture still owes many of its common illogical behaviors to our tribal nature. Who needs make-believe, when nature offers so much excitement and so many mysteries waiting to be solved? In this week’s eSkeptic, Peter Boghossian reviews Guy P. Harrison’s latest book, 50 Popular Beliefs That People Think are True (Prometheus Books, 2012, ISBN-13: 978-1616144951). Dr. Peter Boghossian teaches critical thinking, science and pseudoscience, and atheism at Portland State University. Rarely has a skeptic gone to battle against nonsense with the warmth and humor found in 50 Popular Beliefs That People Think are True. Author Guy P. Harrison, an award-winning journalist and long-time advocate for science and reason, delivers a grand tour though the bizarre ecosystem of irrational beliefs and extraordinary claims. Harrison deftly and compellingly demonstrates how science and reality are preferable to superstition and delusion. Who needs make-believe, he asks, when nature offers so much excitement and so many mysteries waiting to be solved? Readers will find first-rate skeptical treatments of UFOs, psychics, ESP, Atlantis, Bigfoot, astrology, Nostradamus, the Moon landing hoax, Area 51, and other usual suspects—but they will also discover topics that are not as well considered by the skeptical community, but should be. For example, skeptical perspectives on biological race categories, and the race-sports dynamic—covered in the pages of Skeptic magazine in the 1990s but not discussed recently—are thoughtful additions to the skeptical canon. Moreover, his arguments about how television news distorts our view of the real world, even for smart people who should know better, is yet another topic that further differentiates this book from the available literature. Add to this his analysis of how global warming is assessed as a political issue rather than a matter of science, and readers have a comprehensive, provocative tome that will captivate as it educates. Still another differentiating characteristic of 50 Popular Beliefs That People Think are True, is that it has the potential to make a lasting impression on those who harbor beliefs that are out of alignment with reality. Harrison genuinely attempts, and succeeds, at being gentle and sympathetic toward people who hold unwarranted beliefs—even as he mercilessly and systematically annihilates justifications for the beliefs under examination. He articulates how we are all vulnerable to falling for bad ideas and misinterpreting reality due to the influence of culture and the way our brains routinely deceive us about reality. For example, Harrison explains how vision and memory can be misleading. He writes that human memory is not the biological version of a DVR playback system that most people imagine; memory is more like having a little old man who lives inside your head. When you want to remember something, you have to tap him on the shoulder and then listen to the creative tale he weaves about your past. And like most storytellers, the old man adds a bit here, subtracts a bit there, embellishes, distorts, and even lies in an attempt to deliver to you the best story possible. For an individual, however, memories can feel like a perfectly reliable replay of what happened, no matter how inaccurate they happen to be. 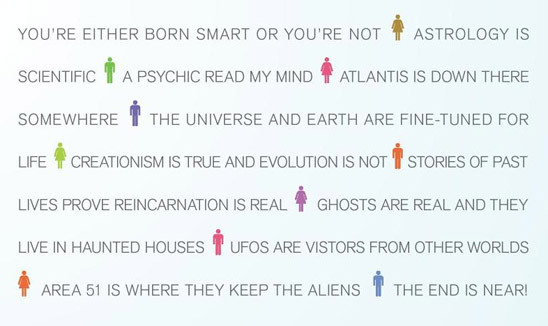 All of this has obvious implications for UFO encounters, ghost sightings, psychic readings, and so on. But beyond this, Harrison helps people feel as if it was not their fault that they were unduly influenced and that this influence skewed the mechanism of belief formation; now that they are aware of influences that take them away from reality they can realign their beliefs on the basis of reliable evidence, and do so without shame, guilt or recrimination. Harrison’s gentle touch doesn’t mean he won’t play rough when it’s needed. Chapters on alternative medicine and the anti-vaccine movement include scathing condemnations of those who promote medical quackery over evidence-based healthcare at the expense of human lives. Through detailed examples, he explains the gravity of what’s at stake because of the tragedy of unreason. For example, Harrison reveals his understandable frustration and anger regarding the strange phenomenon of torturing and killing “witches” in the 21st century. From the abuse of “child witches” by Christians in Africa to the murder of “sorcerers” in rural India by people who fear magic, he shows that humankind has not completely exited the Dark Ages. However, rather than simply state the obvious—that killing people for being witches is tragically ignorant and morally repugnant—Harrison goes further to clearly explain how faith-based thinking in all forms is non-thinking and therefore risky. He shows how even believing in something that seems benign on the surface, such as Bigfoot or the Bermuda Triangle, is a symptom of sloppy thinking that could lead one directly into the grip of a belief that’s pernicious or even fatal. Fortunately, Harrison does not sidestep religion. He pulls no punches in thorough skeptical assaults on prayer, prophecies, miracles, faith healing, angels, heaven, and gods. He avoids condescension toward believers, but provides the necessary brutal frankness regarding the weakness of their claims. Like any well-versed skeptic, Harrison does not claim to disprove or to know that many of these misaligned beliefs are definitively false. Rather, he shows that a multiplicity of claims people believe as true do not have sufficient evidence to warrant belief. (His personal observations at a Benny Hinn faith healing spectacle are informative and highly entertaining. He also shares his own experience of being prayed for after a cycling accident and his encounter with a “spirit guide” during a vision quest). This is a book that both believers and skeptics should read. Many believers are likely to enjoy having their beliefs challenged in this often gentle and always thoughtful way. Seasoned skeptics will find plenty of fresh information and new ways to approach conversations with believers. Readers will also appreciate his vigorous defense of the skeptical worldview, in particular how it protects one from harm and frees one up from empty distractions in order to live life more fully. Finally, numerous interviews with prominent scientists and notable people add to the book’s comprehensiveness. Each chapter ends with a useful list of recommended books, documentaries, and Web sites related to the particular topic of that chapter. 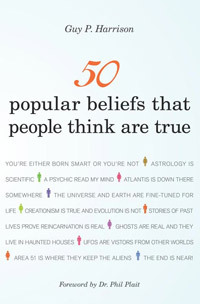 50 Popular Beliefs That People Think are True also includes humorous cartoon illustrations, as well as some photographs and statistical illustrations. It is an ideal text for an introductory Science and Pseudoscience or Critical Thinking course. It is clear, comprehensive, non-threatening yet thought provoking while remaining accessible. It’s also a much welcomed and needed addition to every skeptic’s reading list. In this, his magnum opus synthesizing 30 years of research, Dr. Michael Shermer presents his comprehensive theory on how beliefs are born, formed, nourished, reinforced, challenged, changed, and extinguished. Essentially: beliefs come first, explanations for beliefs follow. We form our beliefs for a variety of subjective, personal, emotional, and psychological reasons in the context of environments created by family, friends, colleagues, culture, and society at large; after forming our beliefs we then defend, justify, and rationalize them with a host of intellectual reasons, cogent arguments, and rational explanations. GET AN AUTOGRAPHED COPY OF THIS BOOK. 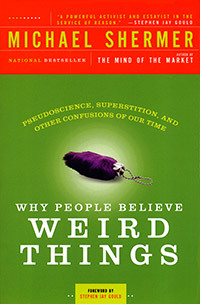 A no-holds-barred assault on popular superstitions and prejudices, this book debunks these nonsensical claims and explores the very human reasons people find otherworldly phenomena, conspiracy theories, and cults so appealing. 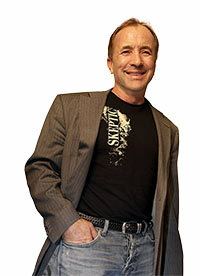 Michael Shermer, Pat Linse, Eds. Two volumes include and A–Z debunking of all things paranormal and pseudoscientific including case studies and in-depth analyses, a pro and con debate section, plus historical documents on many topics. This was published as a library reference book. Save over $50.00 off the price charged to libraries. 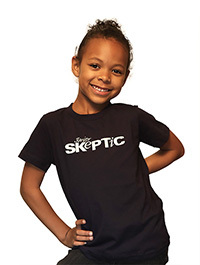 GET THE SKEPTIC ENCYCLOPEDIA.